Second in the Ratio: Pancakes series. I’m participating in the Ratio Challenges this year, hosted by Seattlejo of Fat and Crafty, and experimenting with ratios from Michael Ruhlman’s Ratio: The Simple Codes Behind the Craft of Everyday Cooking . Read more about my experiments here. Depending on how you like your apple, you might want to grate the apple instead of mincing it. I think grating it might allow it to better blend in with the pancake. These came out very nicely and made for an excellent breakfast. 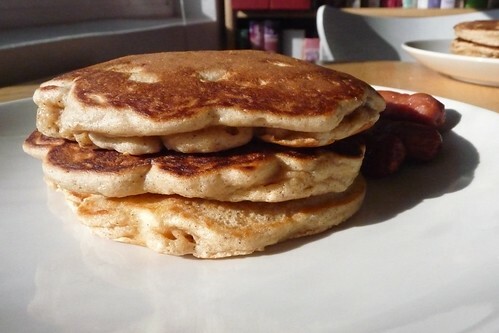 Using the whole wheat pastry flour made for fluffy, soft pancakes without being too overpoweringly “wheaty”. Spelt flour would also be an excellent choice, especially if you’re gluten-free. Combine wet ingredients in a small bowl, combine dry ingredients in a medium bowl. Add wet to dry and stir well, then add diced apple. Add more milk to thin if desired or needed. Heat a lightly oiled pan over moderate heat and fry until golden. This is definitely one to be served with powdered sugar and/or maple syrup. This turned out really well, but the apples definitely need to be minced. I think it might even be better if they were lightly cooked to soften them up. Another really good way to incorporate the apples would be to use apple preserves or top with apple jam. Interestingly enough, very little milk had to be added to thin out the pancake batter to a proper consistency. Given that, over the past few days, our ambient humidity has been over 85% with lots of fog, rain and snow, I believe that humidity is very much a factor in this ratio as is the weight of your egg. An egg for the purposes of the ratio needs to weigh 2 ounces. Some large eggs qualify but an extra-large egg seems to be the closest to 2 ounces according to the reports from other folks in the Ratio Wave. This entry was posted in american, breakfast, Ratio, untranslated. Bookmark the permalink.